This high performance trail-riding protector backpack combines plentiful storage, comprehensive back protection and integrated ventilation. The Evoc FR Enduro Blackline Protector Backpack is the next level in comfort, protection and practicality. Evoc's FR Enduro Blackline Protector back pack represents the ultimate combination of innovative ventilation and certified technology standards that come with all Evoc's protector backpacks. A standout feature of the pack being an innovative Liteshield Back Protector, offering 95% shock absorbtion in the event of an unfortunate fall. 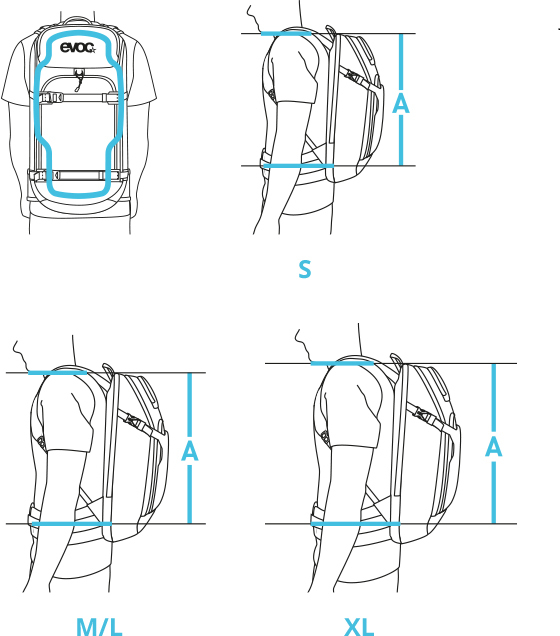 Evoc FR Enduro Blackline Protector Backpack is rated 5.0 out of 5 by 4. Rated 5 out of 5 by vmgscot from Nice piece of kit Was looking to replace my Camelbak HAWG NV but also liked the idea of a back protector now I am knocking on a bit. Measurements suggested I was at the bottom of the XL size but this was way to long and ended up swapping for the M/L size for my 6ft2 body. IMO, the Evoc seems better materials and manufacture than the Camelbak I am replacing. I really like the easy access bladder storage. Even through it's only a 16l it swallows everything that filled the 20l HAWG (although that could unzip to 30l). The fit is much more secure on the body then the Camelbak that tended to flop about even after cinching down the straps. I suspect a lot of this is down to the Evoc wasteband system which makes the pack rock solid on my back and seems to take weight off the shoulders. Negatives - no rain cover but the one off my HAWG fits so no worries. I also use my old Camelbak bladder in the Evoc as it doesn't have one - fits fine. Rated 5 out of 5 by EnduroMonkey from Superb. Worth the money All my enduro riding buddies use this bag for the simple reason that it is the best. Fit is excellent (I'm 5'8", have a S/M size), and the back protector has performed well in several big crashes. Pack is big enough for a full day adventure - if you're bikepacking then go for the bigger (20L) bag. Well, well worth the money. Like helmets - when you have a big crash you never regret having the best kit. Rated 5 out of 5 by Scottmcewa from Great pack with all the space and features you need for essentials on the trail and the back protector gives added peace of mind when things get technical. Rated 5 out of 5 by excitable1 from Great for dodgy backs ! Sounding like an old man (which I'm not), I suddenly suffered some serious back pain mid ride and I felt my old Hawg was a big contributor, sitting too low and feeling like it was pulling down most of the time and never feeling like it was totally secure. The Evoc's were recommended to me by someone who'd had similar issues and the certified back protector I felt could only help. Out the bag this pack looks huge, almost off putting, but it narrows when it's packed and on and mates say it doesn't look big at all. The tool storage and belt pouches are good with loads of well organised room. The ones that are meant to are actually accessible when your on the bike. The top pocket is big enough for a phone, wallet and keys together with room left for other bits you want quick access to. The fit is what makes it for me. Even with 3L of water you can hardly tell it's there. The fit is so snug it feels like you're wrapped up in it. Most importantly there's not one ounce of pull on the back or movement during a ride. The back protector feels like it's giving support too. In all the above areas it beats my previous Hawg 10x over. My only criticism is the main storage area being compromised by the bladder because it doesn't have its own compartment, so you'll have to pack baguettes to squeeze them either side of a full bladder. Definitely (almost) worth the money. Does the bag come with a water/weather proof over cover and bladder..??!! This pack should include a Transparent Tarpaulin for weather protection. These pack are very long. Compare the length to other packs and you'll see what I mean. I'd go with the medium first. Is this the 2014 model? Other shops/sites describe this or a very very similar backpack as &quot;Evoc Freeride Enduro Blackline 16L 2014&quot;. Is this backpack the 2014 model? I can confirm that it is indeed the 2014 model. Can the spine protector be used on its own without the backpack?